Do your beliefs hold you back or propel you forward? I saw this movie a decade or so ago called “What the bleep do we know? !” It gave a simple and down-to-earth introduction to the confusing world of quantum physics. One of the scientists interviewed for the movie was asked: “So hypothetically – can you walk on water?” To which the scientist replied: “Yes you can, if you truly believe it.” The entire movie is really about the power of belief to shape our reality, and make no mistake – we do it all day every day. The way we view the world and interact with it is based on our deeply held beliefs about ourselves and about reality itself. Those beliefs can drive us forward or hold us back, strengthen or ruin relationships, enrich our lives or make them miserable. If something is not working in your life, it might be useful to examine the governing beliefs that are shaping your reality. This can be rather hard, since those beliefs are very deep and quite tangled. But don’t worry; as with everything else, the yoga tradition has a map for you to follow. But before we get to that, let’s figure out what a belief is and where it comes from. “A belief is a story in your head, a cause-and-effect chain, like a recipe or rule for action. The basic recipe looks like this: If you have a need, then look for a belief that provides a rule for action to get the result you want.”(1) If you feel lonely (need), then seek company (belief). If you follow this belief, go hang out with a friend (action) and feel less lonely (result), then your belief has been validated. We all have a variety of needs; the most famous map of those is Maslow’s hierarchy of needs. In 1943 Abraham Maslow proposed “A Theory of Human Motivation”, where he attempted to explain why we (humans) do the things that we do. He suggested that human beings are arranged like a ladder, with certain needs defining every step of it. You would need to fulfill the needs of each step to be able to climb onto the next one. Later on, the strict hierarchy of those needs was challenged. If you are hungry, it is hard to focus on self-actualization, but it is possible. So now it is accepted that the order of those needs can vary from culture to culture, from person to person, and can depend on circumstance, or your age. Ultimately, at any given time you have more urgent needs and these are the ones you pay most attention to. When you are little, your needs are very basic and based on how those needs are met, you form beliefs about them. As we get older and gain more and more experience, our brains consistently organize and store information on what it takes to fulfill our needs. It becomes a learning loop. “I want to feel warm outside (need), so I put on a coat (belief)”. You put on a coat (action) and feel warm (result), which confirms your belief (feedback). 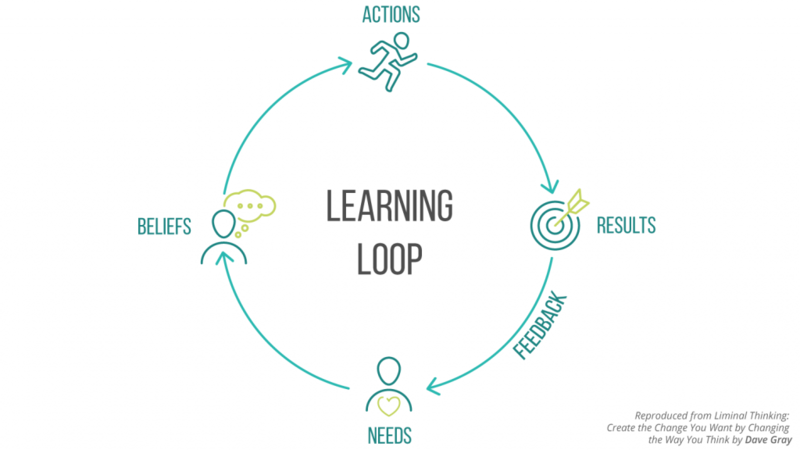 By running those feedback loops, we reinforce our beliefs. We can form all sorts of beliefs that can be useful or not useful. When we are young we test different sorts of beliefs to see what would work best. A typical example – a child’s screaming fit at a grocery store. “I want this piece of candy (need), and I can get it by crying and screaming (belief).” So the kid starts to have a fit (action) and if the parent gives in and buys that candy (result), the kid gets the message “That worked, I will do it again next time” (the belief has been confirmed). This can become problematic when it concerns our governing beliefs that are closely tied to our identity. 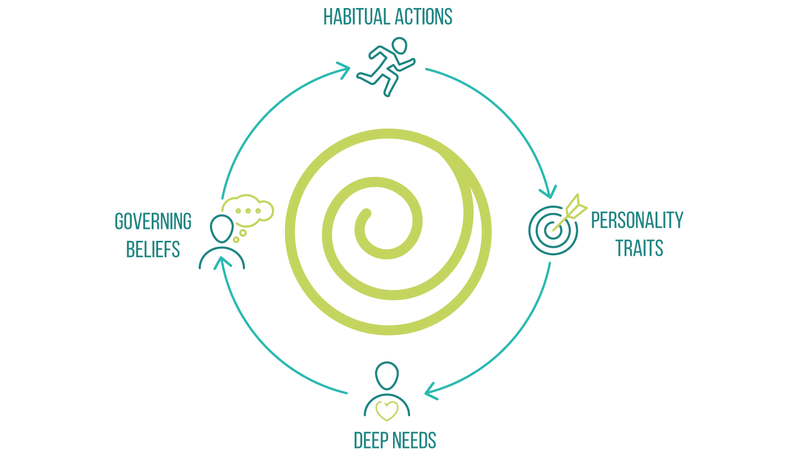 Those are the beliefs that are connected to our deepest needs and define who we are, basically forming the basis of our personality. The yoga tradition has mapped out those deepest needs and the concentration of beliefs around them as symbolic energetic centers in the Chakra model. The Chakra model is sometimes called the map of personality because it helps us identify our deepest needs and potentially the governing beliefs associated with them. Far from being “woo-woo” and “out there”, chakra work involves concrete steps that we can take to examine our beliefs and try to replace the dysfunctional ones with the ones that would serve us better. Over the next few weeks we will take a closer look at the chakras and how we can use them to untangle the web of our deeply held beliefs. Tune in! I am a writer and a teacher/speaker/moderator on behalf of work in and development of spirituality; in addition to those, I pour the lion’s share of my energy into teaching yoga. I have been following your blog and teachings for some years now, and, once again, I just want to thank you for your excellent work. This blog is so wonderfully presented/written: clear, easy language that articulates difficult concepts and gently invites the reader to “step-in” further. And I can’t wait for your follow-up blogs! Thank you so much for all that you are doing. As I have said in previous comments, if I lived in your area, you would certainly be my “go-to-guru,” and I am certain that is not something you pursue. All the same, you are my long-distance-mentor! Oh I wish I had such a way with words! Kevin says exactly what I want to say about your work, giving gratitude for your wonderfully put words of wisdom. I too am hooked with how you explain all the many aspects of yoga – enticing us to read more than just words about the oh so popular physical aspects(although I guess, ultimately all of these things will effect us physically in the end!). Many thanks Olga, for all that you so generously share with us. I third that Robin and Kevin! Every week there is clear, easy and accessible practical and spiritual wisdom. Thank you Olga. Fantastic as always !!! 😀 love your blog!!! I look forward to the next blog about the not woo-woo chakras. I always try to link those metaphoric ways of old with lots of symbolism, to something concrete today with some science behind.